The Comoros (/ˈkɒməroʊz/ ( listen); Arabic: جزر القمر‎, Juzur al-Qumur / Qamar), officially the Union of the Comoros (Comorian: Umoja wa Komori, French: Union des Comores, Arabic: الاتحاد القمري‎ al-Ittiḥād al-Qumurī / Qamarī), is an island country in the Indian Ocean located at the northern end of the Mozambique Channel off the eastern coast of Africa between northeastern Mozambique, the French region of Mayotte, and northwestern Madagascar. 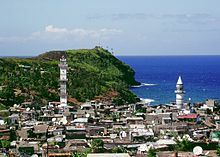 The capital and largest city in Comoros is Moroni. The religion of the majority of the population is Sunni Islam. It became part of the French colonial empire in the end of 19th century before becoming independent in 1975. Since declaring independence, the country has experienced more than 20 coups d'état or attempted coups, with various heads of state assassinated. Along with this constant political instability, the population of the Comoros lives with the worst income inequality of any nation, with a Gini coefficient over 60%, while also ranking in the worst quartile on the Human Development Index. As of 2008[update] about half the population lived below the international poverty line of US$1.25 a day. The French insular region of Mayotte, which is the more prosperous territory in the Mozambique Channel, is the major destination for Comorian illegal migrants who flee their country. The Comoros is a member state of the African Union, Francophonie, Organisation of Islamic Cooperation, Arab League (of which it is the southernmost state, being the only member state of the Arab League with a tropical climate and also entirely within the Southern Hemisphere) and the Indian Ocean Commission. Other countries near the Comoros are Tanzania to the northwest and the Seychelles to the northeast. Its capital is Moroni, on Grande Comore. The Union of the Comoros has three official languages—Comorian, Arabic, and French. About fifty-seven percent of the population is literate in the Latin script while more than 90% are literate in the Arabic script; total literacy is estimated at 77.8%. 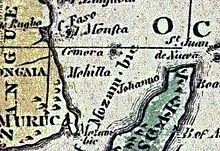 [clarification needed] Comorian has no native script, but both Arabic and Latin scripts are used. There are two types of marriages in Comoros, the Mna dabo (little marriage) and the ada (grand marriage). The little marriage is a simple legal marriage. It is small, intimate, and inexpensive. The bride's dowry is nominal. The little marriage, however, is just a placeholder until the couple can afford the ada, or grand marriage. The hallmarks of the grand marriage are dazzling gold jewelry, two weeks of celebration and an enormous bridal dowry. The groom must pay most of the expenses for this event, and the bride's family typically pays only a third of that of the groom's. The grand wedding can cost up to £55,000. [dubious – discuss] Many men cannot afford this until their late 40's, if ever. The Comoros archipelago consists of four main islands aligned along a northwest-southeast axis at the north end of the Mozambique Channel, between Mozambique and the island of Madagascar. Still widely known by their French names, the islands officially have been called by their Swahili names by the Comorian government. They are Grande Comore (Njazidja), Mohéli (Mwali), Anjouan (Nzwani), and Mayotte (Mahoré). The islands' distance from each other—Grande Comore is some 200 kilometers from Mayotte, forty kilometers from Mohéli, and eighty kilometers from Grande Comore—along with a lack of good harbor facilities, make transportation and communication difficult. Comoros has lots of sun. Politics of the Union of the Comoros takes place in a framework of a federal presidential republic, whereby the President of the Comoros is both head of state and head of government, and of a multi-party system. Executive power is exercised by the government. Federal legislative power is vested in both the government and parliament. Anjouan is an autonomous high island in the Indian Ocean that forms part of the Union of the Comoros. Its chief town is Mutsamudu and, as of 2006, its population is around 277,500. The total area of the island is 424 square kilometers. Moroni is the largest city, federal capital and seat of the government of the Union of the Comoros, a sovereign archipelago nation in the Indian Ocean. Moroni means "at the river". Moroni is the capital of the semi-autonomous island of Ngazidja, the largest of the three main islands of the republic. The city's estimated population in 2003 was 41,557 residents. Moroni, which lies along the Route Nationale 1, has a port and several mosques such as the Badjanani Mosque. Azali Assoumani is a Comorian politician who is the President of the Comoros. He has been in office since 2016. Previously he was President from 1999 to 2002 and again from 2002 to 2006. 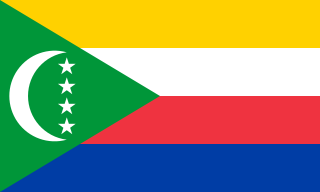 The national flag of the Union of the Comoros was designed in 2001 and officially adopted on January 7, 2002. It continues to display the crescent and four stars, which is a motif that has been in use in slightly various forms since 1975 during the independence movement. In its constitution, the government of the Comoros refers to the insignia as l'emblème national, or the "national emblem", though it is understood to actually represent a flag. 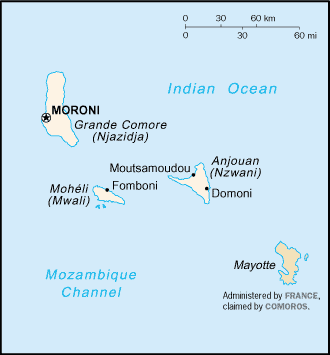 The Comoro Islands or Comoros form an archipelago of volcanic islands situated off the south-east coast of Africa, to the east of Mozambique and north-west of Madagascar. The islet of Banc du Geyser and the Glorioso Islands are part of the archipelago. 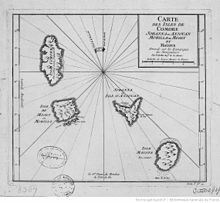 The islands are politically divided between Union of the Comoros and two territories of France : the department of Mayotte and the Glorioso Islands, a part of the Scattered Islands in the Indian Ocean, the 5th district of the French Southern and Antarctic Lands. Grande Comore is an island in the Indian Ocean off the coast of Africa. It is the largest island in the Comoros nation. 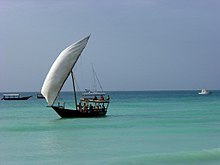 Most of its population is of the Comorian ethnic group. Its population as of 2006 is about 316,600. The island's capital is Moroni, which is also the national capital. The island is made up of two shield volcanoes, with Mount Karthala being the country's highest point at 2,361 m (7,746 ft) above sea level. According to the 2009 revision of the constitution of 2002, it is governed by an elected Governor, as are the other islands, with the federal government being much reduced in power. The name Ngazidja is sometimes seen in the now nonstandard form Njazidja. Ali Soilih, full name Ali Soilih M'tsashiwa, was a Comorian socialist revolutionary and political figure who served as the 3rd President of the Comoros. Elections in the Comoros take place within the framework of a multi-party democracy and a presidential system. The President and the majority of the seats in the Assembly of the Union are directly elected. The invasion of Anjouan, on 25 March 2008, was an amphibious assault led by the Comoros, backed by African Union (AU) forces, including troops from Sudan, Tanzania, Senegal, along with logistical support from Libya and France. The objective of the invasion was to topple Colonel Mohamed Bacar's leadership in Anjouan, an island in the Union of Comoros, when he refused to step down after a disputed 2007 election, in defiance of the federal government and the AU. The Comoros archipelago in the Indian Ocean has had a fractious history since independence from France in 1975, experiencing more than 20 coups or attempted coups. An independence referendum was held in the Comoros on 22 December 1974. The overall result was a strong "yes" vote, with 94.57% of voters voting for independence and almost all the "no" votes being cast in Mayotte, where there was a majority for remaining under French control. In contrast, on Mohéli only five out of 6,059 votes were against independence. Voter turnout was 93.3%. Presidential elections were held in the Comoros on 21 February 2016, with a second round to be held on 10 April 2016, alongside elections for the Governors of the three islands. Azali Assoumani of the Convention for the Renewal of the Comoros was elected President with 41% of the vote.